Internal hernias through the foramen of Winslow are extremely rare. Prompt diagnosis and early surgical reduction are vital to prevent bowel gangrene and avoid resection. We report a case of ileal hernia through the foramen of Winslow in a 48-year-old woman. She presented to the emergency department with acute epigastric pain, and rapid and definitive pre-operative diagnosis of internal hernia of ileum through the foramen of Winslow without ischaemia was made by means of multi-detector computed tomography. Emergency laparoscopic bowel reduction was performed. The postoperative course was uneventful, and the patient recovered rapidly. Internal hernias account for 0.5 - 4.1% of all bowel obstruction. Although uncommon, it is an important differential diagnosis. Internal hernia through the foramen of Winslow (IHFW) is even rarer, accounting for 8% of internal hernias. The nonspecific symptoms of IHFW often result in delayed treatment, which is responsible for a high mortality rate of up to 49%. In the past, the treatment has been laparotomy with reduction of the herniated bowel and resection of gangrenous bowel. We report a case of IHFW in which multi-detector computed tomography (MDCT) enabled rapid, accurate anatomical diagnosis and excluded acute complications. It was followed by laparoscopic reduction, and the outcome was excellent. A 48-year-old woman with no history of previous abdominal surgery presented with sharp epigastric pain of sudden onset, which she had experienced for 3 hours. The pain was persistent and progressive, with vomiting and a sensation of increased abdominal fullness. The patient had had episodes of postprandial abdominal pain and fullness during the past year, but the symptoms had resolved spontaneously. Physical examination in the emergency department revealed local tenderness with mild rebound in the epigastric area. The results of blood tests and biochemical investigations were normal. A plain abdominal radiograph revealed a cluster of distended loops of small bowel filled with air in the upper middle abdomen. Small-bowel obstruction was suspected, and dual-phase MDCT including the abdomen and pelvis, with intravenous but no oral contrast medium, was performed (Fig. 1). It revealed a cluster of dilated sections of ileum in the lesser sac, with redirection of the accompanying superior mesenteric arterial branches and narrowed afferent and efferent loops at the foramen of Winslow located opposite, i.e. between the inferior vena cava and the lesser omentum. An internal hernia of ileum through the foramen of Winslow without ischaemia was diagnosed, and the patient underwent laparoscopic reduction within half an hour after the MDCT study and 7 hours after the onset of symptoms. Operative findings were internal herniation of ileum into the lesser sac through the foramen of Winslow, without ischaemic changes. After reduction, the foramen of Winslow was packed with omentum. The postoperative course was uneventful, and the patient was discharged 3 days later. An internal hernia is a viscus protruding from its original position through a mesenteric orifice. Internal hernia is a rare cause of bowel obstruction, and only 8% of cases are IHFWs. The foramen of Winslow, the communicating foramen between the lesser sac and the greater peritoneal cavity, is about 3 cm in size and located anterior to the inferior vena cava, posterior to the lesser omentum (containing the hepatic artery, portal vein and bile duct), caudal to the hepatic caudate lobe, and cephalad to the duodenal bulb. IHFW can occur at any age, but is most frequent between the 3rd and 6th decades. It is more common in males than in females (ratio 2.5:1). Predisposing factors for IHFW include an enlarged foramen of Winslow, a long small-bowel mesentery, a persistent ascending mesocolon, an elongated right hepatic lobe, a change in intraabdominal pressure, and a large, mobile gallbladder. The incarcerated organs of IHFW in order of frequency are small bowel (63%), caecum, distal ileum and ascending colon (30%), transverse colon (6%) and gallbladder (1%). The symptoms of IHFW are nonspecific and variable, ranging from indistinct abdominal pain that occurs spontaneously and then resolves to an acute abdomen in the form of bowel obstruction with nausea, vomiting, abdominal fullness and severe tenderness. If the hernia reduces spontaneously and easily, the clinical symptoms may be transient and mild. During periods without symptoms, the findings on clinical examination and radiological studies may be normal. The clinical diagnosis is often delayed, with symptoms only apparent when the herniated bowel is strangulated or incarcerated. The rate of bowel resection due to gangrene resulting from a delayed diagnosis of IHFW is up to 64%, and the mortality rate is up to 49%. In the past, only 10% of cases of IHFW were accurately diagnosed or suspected pre-operatively, despite use of multiple diagnostic imaging modalities. The most common features of IHFW on plain abdominal radiographs are clustering of the distended bowel loops with air, or an air/fluid level in the middle upper abdomen between the liver and stomach. The clustered herniated loops of bowel may cause mass effects with anterior and lateral displacement of the stomach. Furthermore, the ascending colon and caecum are displaced from their normal location to the lesser sac if they are involved. 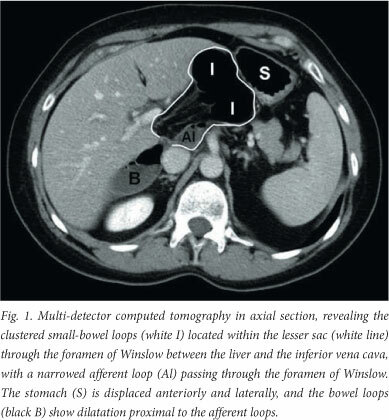 A small-bowel follow-through has been the method of choice for diagnosing IHFW, with features such as a cluster of dilated bowel loops in the lesser sac and some degree of obstruction indicating the presence of the condition. A transition point between dilated and non-dilated loops of bowel, as a result of passing through the foramen of Winslow, can sometimes be observed. An upper gastrointestinal study can show whether the stomach is in the anterior lateral aspect of the herniated bowel loops. Lower gastrointestinal studies can display obstruction or the point of narrowing while passing through the foramen of Winslow. However, barium studies of this sort are time-consuming and need co-operation from the patient, so they are not suitable for a patient suffering severe abdominal pain in the emergency department. Furthermore, barium studies are contraindicated in bowel obstruction or when strangulation or perforation is suspected. Computed tomography (CT) has been proven to be of value in the diagnosis of bowel obstruction, with a sensitivity of 94 - 100% and specificity of 90 - 95%. MDCT has fast high-resolution images that can provide multi-planar image reconstruction and CT angiography. It can clearly display the location and severity of bowel obstruction and provide a precise differential diagnosis of the cause, including internal hernia. MDCT is suitable when clinical evaluation and initial imaging are inconclusive or when strangulation is suspected. We suggest intravenous contrast-enhanced dual-phase MDCT, including an arterial phase for CT angiography and a 60-second delay venous phase, scanning from abdomen to pelvis for patients with indeterminate acute abdominal pain, especially in those who had bowel obstruction before presenting with peritoneal signs. Not using oral contrast medium can help in assessing poor bowel wall enhancement, intramural gas and signs of bowel gangrene, and avoid interfering CT angiography reconstruction. MDCT findings in IHFW include a cluster of dilated bowel loops in the lesser sac with their accompanying vessels and mesentery passing through the foramen of Winslow between the inferior vena cava and the liver hilum. When the bowel loops pass through the foramen of Winslow, afferent and efferent loops and narrowing of their diameter can be observed clearly. The herniated bowel loops may cause anterior lateral displacement of the stomach. Surgical treatment includes reduction of herniated loops of bowel and resection of bowel segments with gangrenous change. Laparotomy is the operation most often used, and laparoscopic reduction without bowel resection has been reported. MDCT can provide detailed anatomical information and indicate the degree of ischaemia for surgical planning, enabling early mini-invasive laparoscopic reduction and avoiding resection of gangrenous loops of bowel. No consensus on suturing the foramen of Winslow has been established, as this procedure carries a risk of injury to the common bile duct, portal vein and hepatic artery proper. Right hemicolectomy may be performed if there is a mobile ascending colon with a long right mesocolon, to prevent recurrence. Internal hernias through the foramen of Winslow are extremely rare, and the diagnosis can easily be missed or delayed, leading to the necessity for bowel resection and a high mortality rate. A high degree of clinical suspicion, with rapid pre-operative diagnosis by means of a simple diagnostic imaging tool, MDCT, is mandatory for early laparoscopic reduction and a good prognosis.